Elmo 104 with its pistol grip[ detached but fitted with a KAISER rubber lenshood and a 'Zodel' (Wallace Heaton Brand; made in Japan) 1A 52mm skylight filter. 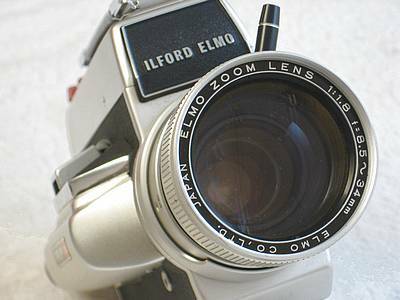 Close-up of zoom lens (lens hood & filter removed), showing its focal range (8.5mm to 34mm) and maximum aperture (f1.8). Made in Japan. 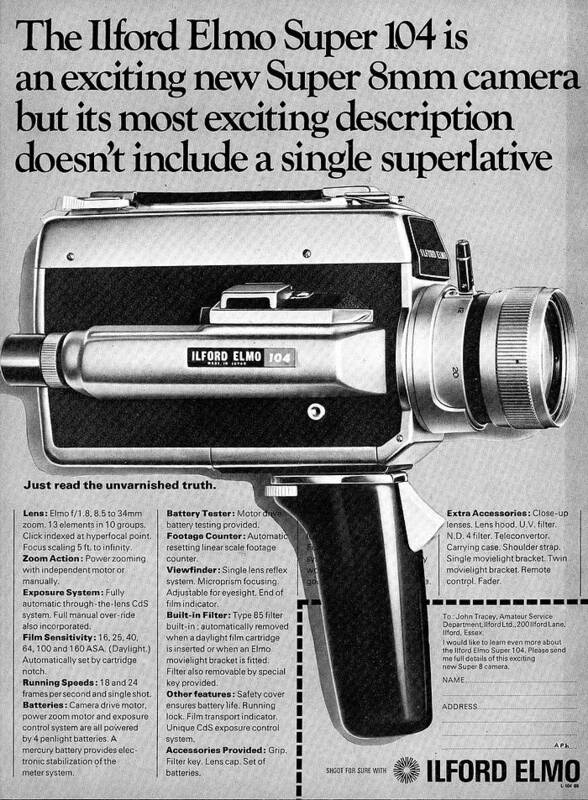 Side views of the Elmo 104. Thge left hand side is taken up with the through the lens viewfinder (adjustable for individual eyesight and enabling reflex focussing) and the right hand side has rotary controls to switch from 18 to 24frames per second and from Auto to Manual exposure. 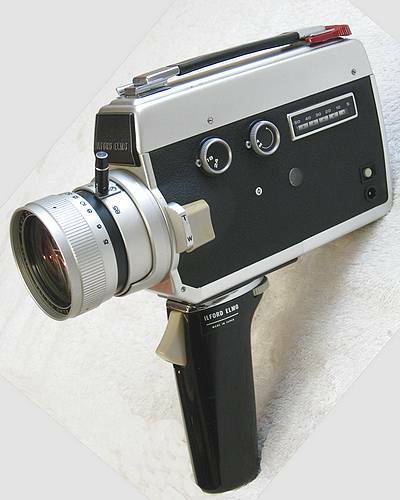 There is also the motorised zoom control switch (as well as a foldable manual zoom 'lever' on the lens collar). 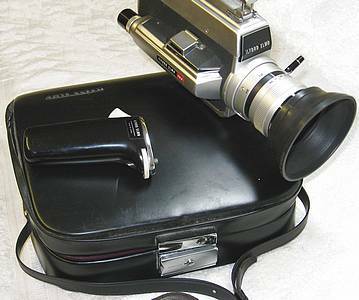 The right hand side also carries a linear film footage indicator. Rear top view. 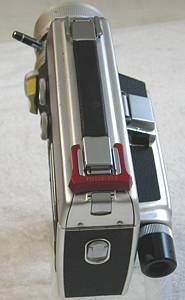 The red plastic insert at the rear is the special 'filter key' that enables manual control over use of the built-in Type 85 filter (making daylight suitable in colour temperature for tungsten balanced film). Rear door hinged down, showing the film compartment and viewing to the 8mm film 'gate'. 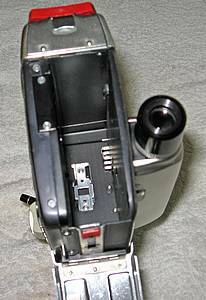 To the upper left can be seen two small flat-head screws that provide access to the PX625 1.35v mercury cell battery that stablised the CdS meter. Mercury cells are no longer available, though work-arounds exist. 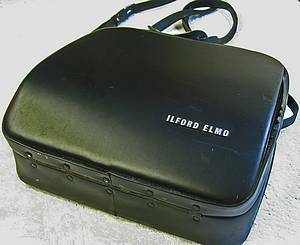 The smart ILFORD ELMO carrying case with shaped lining to accomodate the camera with its pistol grip attached. 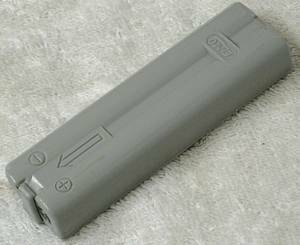 Plastic battery container for 4 conventional AA 'penlight' cells. 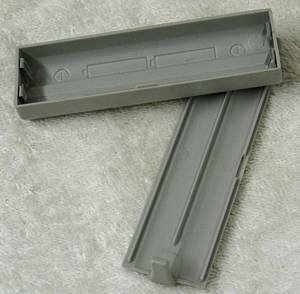 The container slides in the top rear, just below the carrying handle. 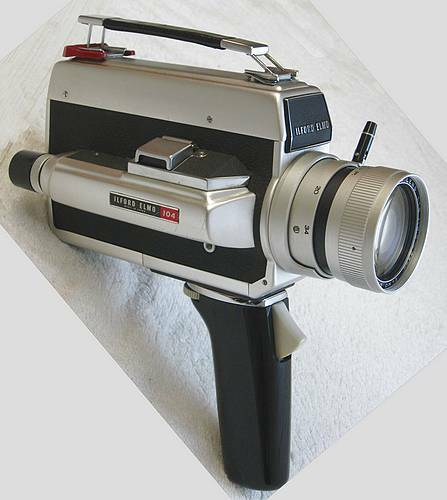 These batteries provide power to the film drive motor, the power zoom and the auto-exposure system.